Yeah, it's never bad to be in the shoes of Frederick the Great! In this solo scenario (Lobositz) I'm closing with the Austrians and their unknown intentions. Figure 1. 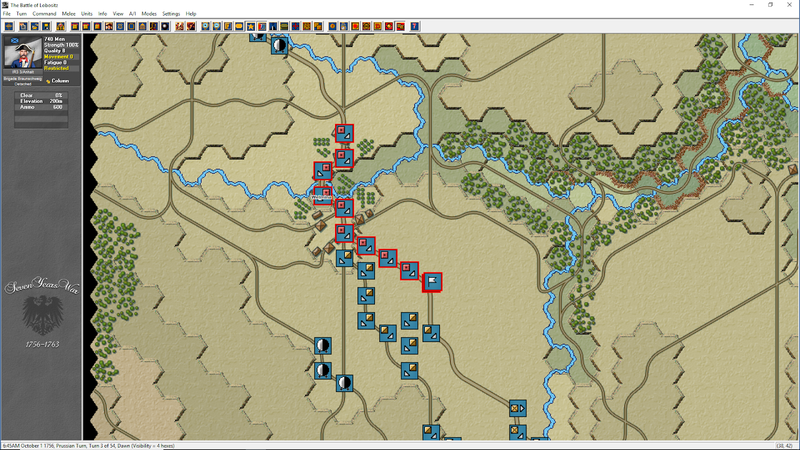 The Prussian Army (blue icons) is moving east through the funnel shaped by the Lobosch and the Homolka. In my previous video I mentioned the old use of the phrase "order of battle" (when, who and who would move during the initial stages of the battle). In the whole game, I find it very enjoyable to work through these type of details. 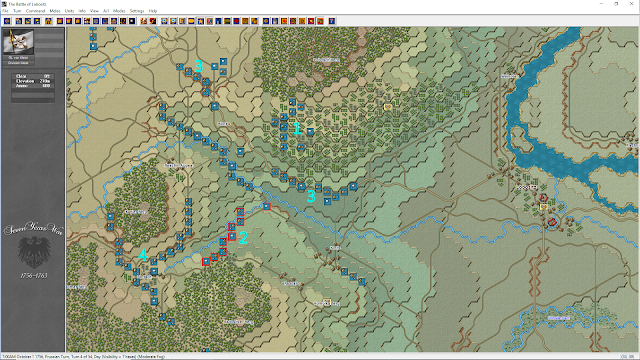 It's very easy to get units entangled, disorganized and just plain stuck into bad terrain. The consequences of a poor "order of battle" are tremendous, getting late to battle is just the first one. Figure 2. Maneuver graphic created with MilSketch. First off, I would like to say this: it would be great for JTS's games to have a layer in which you can lay out your battle plans for later review. In this case, I had to use an external program (MilSketch, figure 2). There, I said it. Coming back to the battle plan (figure 2), there are four objectives and my plan of battle involves three main maneuver units. The Orzten Brigade, a unit composed of Dragoons is tasked with taking the orchards/vineyards east of the Lobosch. 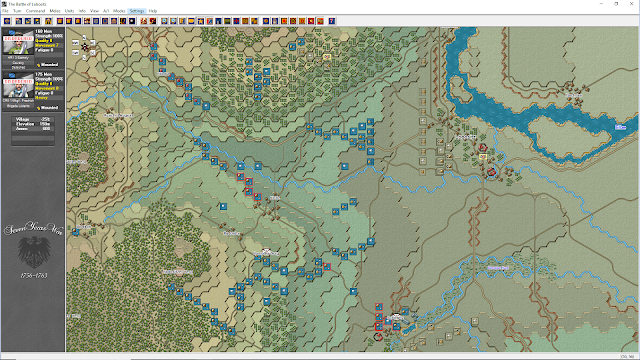 The von Kleist Division (infantry) will sequentially seize the heights of Homolka and, on order, seize Sullowitz. 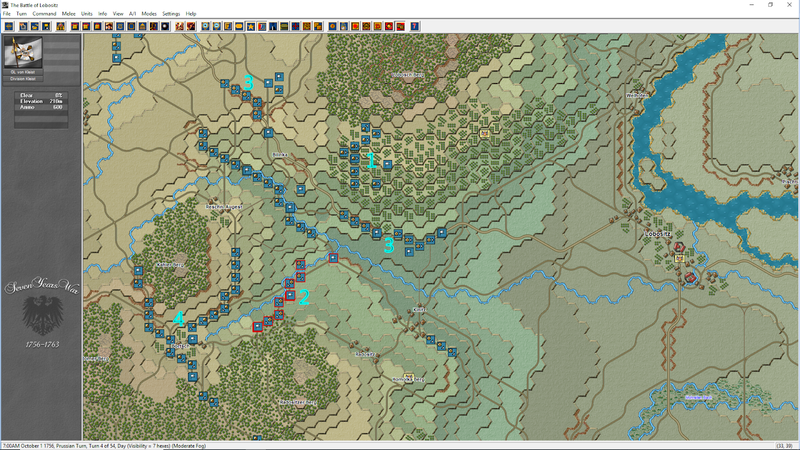 The von Preussen Division (infantry), supported by all the available artillery, will initiate the main attack on Lobositz. The full support of the Kleist Division is expected, after Sullowitz is seized. It is important to note that there are plenty of Cavalry Brigades which I intend to use in support of the two infantry divisions. Figure 3. The artillery batteries finally moving through the village of Welmina. Note how the cavalry units made way for the cannons to use the main road. Figure 4. 7:00 AM. The Dragoons led by Orzten are struggling through restricted and sloped terrain (1). 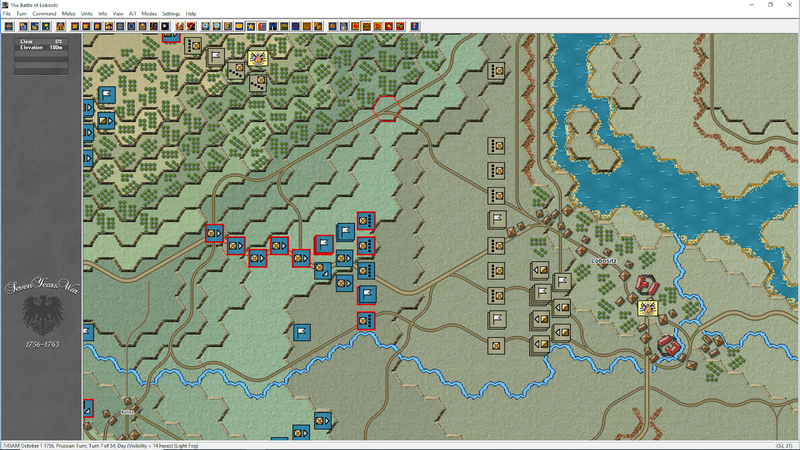 The von Kleist Division is still in transit towards the Homolka heights (2). The von Preussen Division is making good progress towards Lobositz, although divided in two main bodies, each a brigade (3). 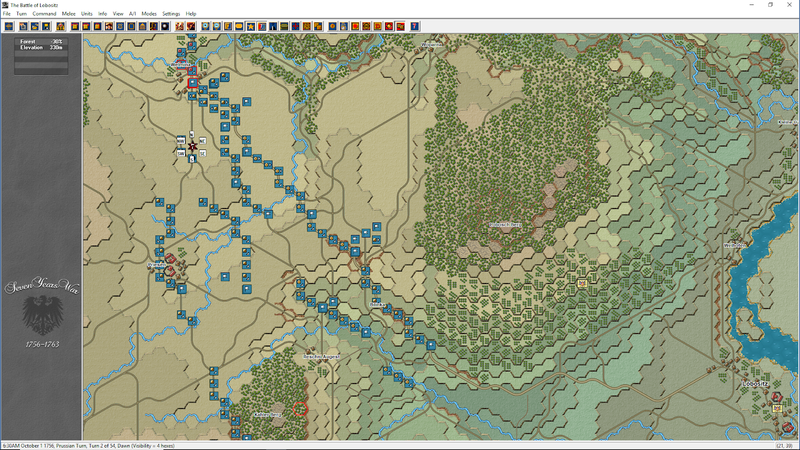 Note the cavalry units using roads to the west (4), to prevent traffic jams with the von Kleist Division. Figure 5. The Homolka heights were seized with no enemy contact, and some cavalry avant guard units did the same on Sullowitz. The enemy was observed deployed east of the village, which suggests that they are covering their army's south flank. Figure 6. But is not all that great up north in the groves/vineyards east of the Lobosch. The Austrian infantry is there for good, fully deployed and waiting for our horses to be cut in front of them. Figure 7. 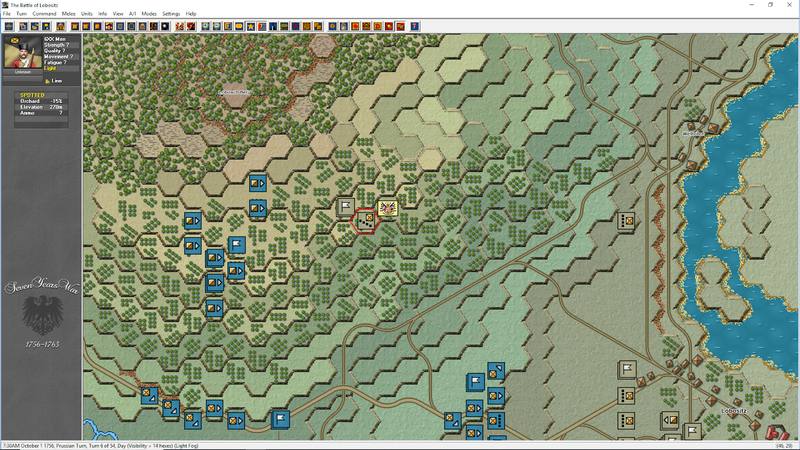 And the Austrian deployment in front of Lobositz appears formidable, worth an attack by more than one division. Figure 8. 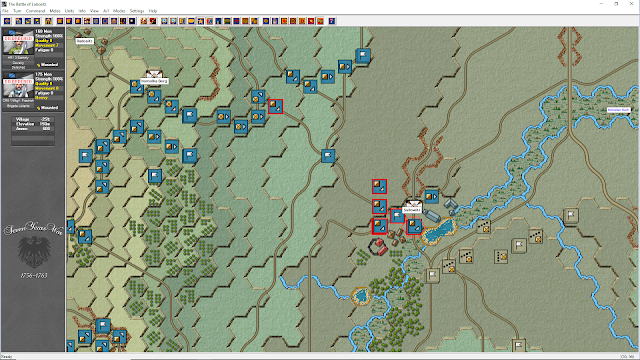 But on the bright side, the overall situation appears favorable if I can manage to hold Sullowitz and block enemy reinforcements from there to Lobositz. Hi, first of all congratulations for your great great blog!, great and funny articles of the very same games I like most. 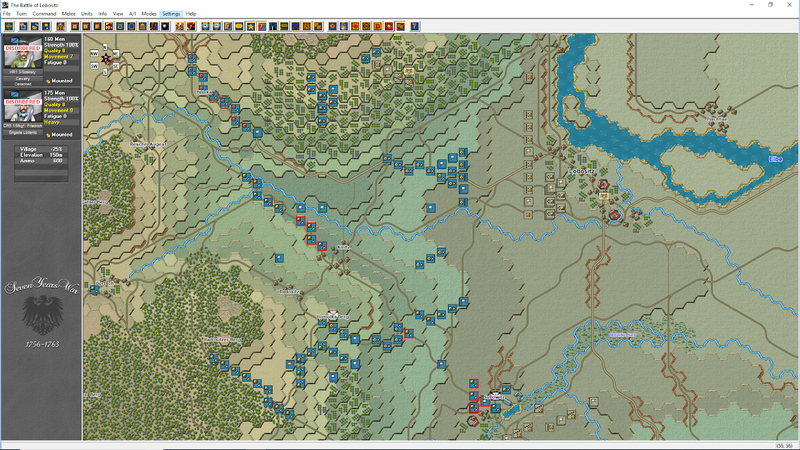 This seven years game is a gem, I dreamed about it for more than 15 years!, since the first hps napoleonic game, eckmuhl. Thanks for keeping the wargamers informed and entertained. Gracias por leer estas notas a pesar de lo infrecuentes que son. Que los que te leemos todos los días, te apoyamos desde lejos, aunque no siempre comentemos. Muy agradecido por el buen gusto que tienes. De mis blogs wargameros favoritos. Lo primero que hago al llegar al trabajo, revisar tu blog. Un gustazo saber que tengo un lector en Latinoamerica (yo soy de Argentina).